Not the nicest man ever – during his reign, King Leopold II (King of the Belgians) owned a small park for himself… All for himself. That small park is what we know today as the Democratic Republic of the Congo! Atop his horse, Leopold II never traveled to ‘his’ Congo. Ownership & the wealth that flowed from there were enough. 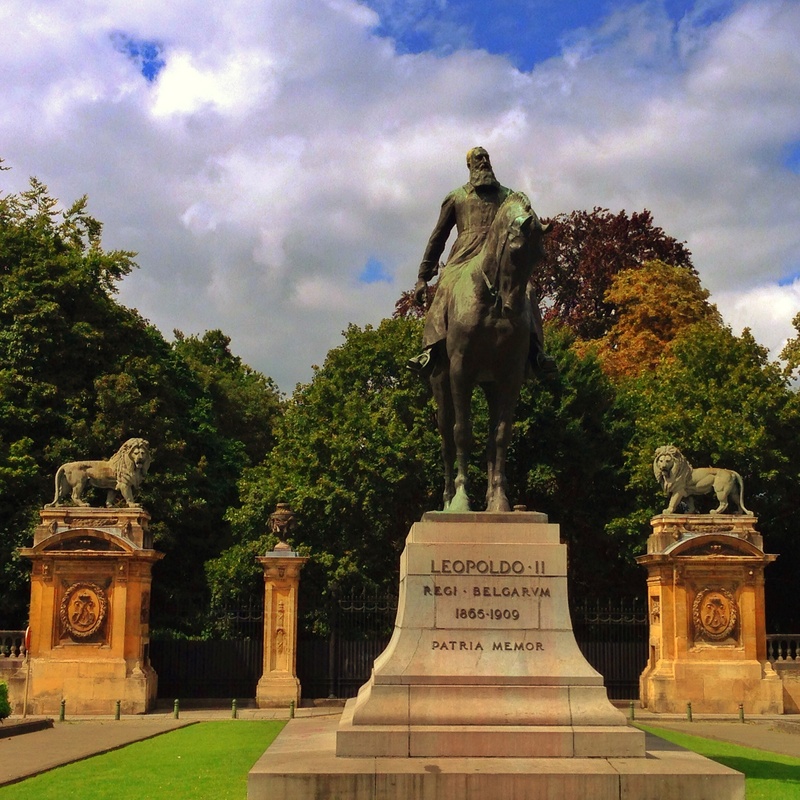 The lions at the gates to The Royal Palace behind this statute of Leopold II are a bit symbolic, as at one time he owned a good percentage of all the lions of the world, the wildlife, the people, the land & the resources of The Congo. The book Heart of Darkness originates from this time. He was maniacal, despotic & he ruled over this land that no one knew about as it was the interior of the ‘dark continent’… All Leopold II’s contemporaries in other European countries, Portugal, England, France & Germany had already carved up Africa that they could reach from the coastline… The remainder in the center, Leopold II took for himself. Other than a few whom he knew, business interests, knew the extent of what was happening in The Congo during these decades when the resources were brought back to Europe. Once (I believe it was) Heart of Darkness was published, it took many years for The Belgians to bring an end to this period of severe atrocities… (I believe, can’t remember all the details) it was after his death that things were allowed/pushed to be changed. Ignorance of the times, no internet, slow methods of travel, no phones & televisions, etc., allowed Leopold II to keep this secret even from his own countrymen & most of the government itself. Needless to say, there are not many tourists visiting this statute to Leopold II and it & Leopold II are not a center of pride for the people of Belgium. But alas, that is history, something that cannot be erased. It is okay to set aside, but forgetting it is unacceptable. I was going to go to the African Museum here, where many of his treasures are housed, but it is closed. It is akin to the British Museum, but only for Central Africa.